LANSING — Former Senate Minority Leader Gretchen Whitmer, a Democrat from East Lansing, officially launched her campaign for governor on Tuesday, allowing her to begin raising money for the race more than 670 days before the 2018 general election. 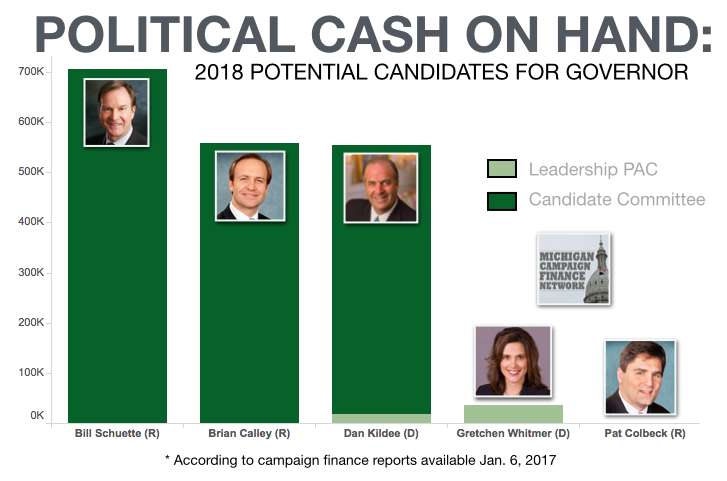 In light of her announcement, multiple political operatives predicted to MCFN this week a candidate for Michigan governor in a competitive primary race in 2018 would likely need about $3 million dollars in funding to contend in the primary alone. Some of the potential candidates are already on their way to that figure. Attorney General Bill Schuette, a Republican from Midland, Lt. Gov. Brian Calley, a Republican from Portland, and U.S. Rep. Dan Kildee, a Democrat from Flint, all have large stockpiles of campaign cash sitting in accounts that could be used for a gubernatorial campaign. As of Oct. 20, Schuette, who can’t seek re-election as attorney general, had $706,286 cash on hand in his attorney general candidate committee. He reported raising $481,821 in 2016 alone, as of Oct. 20, 2016. Kildee, who won re-election to his House seat in November, reported having $537,739 left over in his federal candidate committee on Nov. 28. He’s also affiliated with a leadership PAC, Michigan’s Future, which has $17,162 cash on hand. 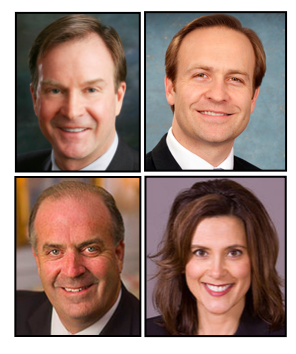 Under Michigan law, Schuette, Calley and Kildee would be able to transfer unlimited funds in their current candidate accounts to new gubernatorial committees if they decide to get in the race. They couldn’t make the same unlimited transfers from leadership PACs they control. State Sen. Patrick Colbeck, a Canton Republican, has also been floated as a potential candidate for governor. He reported having $170 in his Senate candidate committee account on Oct. 20, 2016. As for Whitmer, term limits forced her out of the Michigan Senate in 2014. Her state senate candidate committee account is closed. However, she’s maintained a leadership PAC since 2005. The PAC reported raising $62,165 in 2016 and having $37,619 cash on hand as of Oct. 20, 2016. 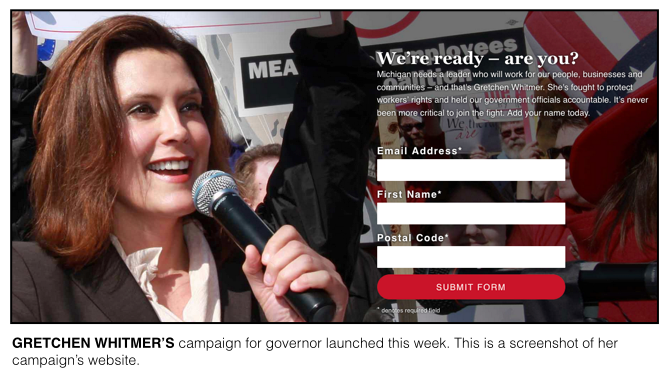 Whitmer officially formed her gubernatorial committee, Gretchen Whitmer for Governor, on Tuesday, allowing her to begin raising money directly for her campaign. Under Michigan law, she can now raise up to $6,800 from an individual and up to to $68,000 from a PAC for the committee. In addition to the candidate fundraising, Michigan has a public-financing program for gubernatorial races. It allows candidates to receive a two-to-one match for contributions of up to $100 from individuals. Candidates who take advantage of the program can receive up to $990,000, but they must spend less than $2 million in the primary election. That spending limit is removed if another candidate in the race uses large amounts of his or her own personal wealth. Much of what happens with fundraising in the gubernatorial race will depend on which candidates actually get in the race and what their opponents' fundraising abilities are. Michigan hasn’t seen a competitive primary for governor on the Democratic side since 2010 and before that, the last one was in 2002. Much has changed when it comes to campaign finance over that time period. Races are more expensive, and outside spenders, like Super PACs, are now playing a larger role. In 2002, Jennifer Granholm won the Democratic nomination with 47.6 percent of the vote. She raised $7 million for that primary with $436,000 coming from her previous attorney general committee. In 2010, Lansing Mayor Virg Bernero raised $1.0 million for his gubernatorial primary campaign against Michigan House Speaker Andy Dillon, who raised $1.8 million. 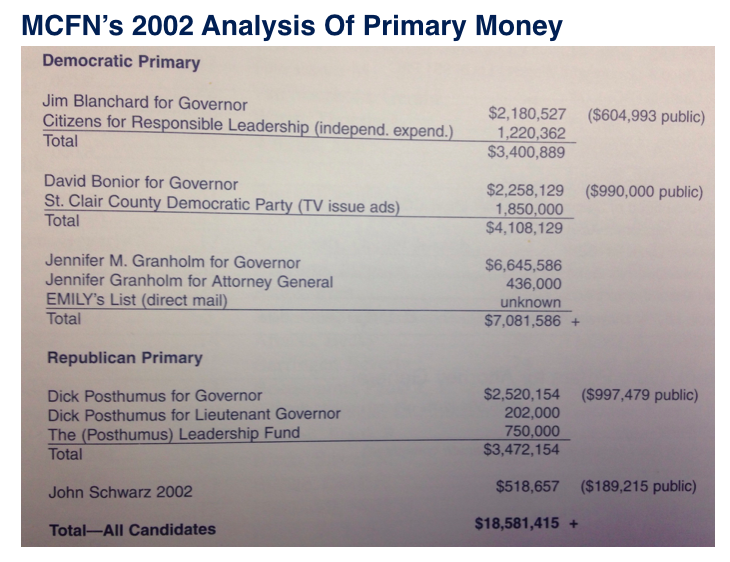 The biggest fundraiser of the 2010 primaries was on the GOP side. Businessman Rick Snyder won the Republican primary after raising $8.0 million with $6 million coming from his own personal wealth. Because of Snyder’s self-funding, his primary opponents in 2010 were able to spend above the traditional $2-million limit tied to the state’s public-financing program. If a self-funding candidate, like Snyder, emerges in 2018, the cost of the overall races could balloon. Of the potential gubernatorial candidates most frequently discussed, Schuette has been the most effective fundraiser in 2016. He raises money through a nonprofit organization, an administrative account and his candidate committee. Through the first three quarters of the year, Schuette’s three accounts had received a total of about $752,000. According to the Michigan Campaign Finance Network’s tracking, the top disclosed donors to Schuette since 2007 have been the following: Michigan Health & Hospital Association ($197,050); Michigan Republican Party ($187,216); Dow Chemical ($175,000); DeVos family ($122,800); and Miller Canfield PAC ($114,684). Kildee’s leadership PAC and congressional candidate committee have raised $654,947 through Nov. 28 in 2016. According to the Center for Responsive Politics, the top donors to Kildee’s candidate committee over his career have been the following: the United Auto Workers ($30,000); American Crystal Sugar ($30,000); Machinists/Aerospace Workers Union ($30,000); Operating Engineers ($30,000); and the Plumbers/Pipefitters union ($26,250). Calley’s candidate committee has raised $288,375 as of Oct. 20 in 2016. The top donors to his lieutenant governor committee since it started in 2010 have been the following: DeVos family ($27,200); David Meador and family, of DTE ($25,000); the Nicholson family, of PVS Chemicals ($21,400); Michigan Beer & Wine Wholesalers Association ($20,000); Michigan Bankers Association ($15,000); and Michigan Chamber PAC ($15,000). Since the start of 2007, the top donors to Whitmer’s Senate candidate committee and leadership PAC have been the following: Blue Cross Blue Shield of Michigan ($35,000); Michigan Beer & Wine Wholesalers Association ($22,559); Michigan Health & Hospital Association PAC ($17,700); DTE Energy ($13,100); the United Auto Workers ($12,500); and Consumers Energy ($12,500).